This posting continues from the posting On Positive Psychology and Holon Physiology and look at the concepts of Positive Psychology in light of the Matter-Being Paradigm, namely in the perspective of a Participatory Local—Non-Local Universe. Divination (from Latin divinare “to foresee, to be inspired by a god”…) is the attempt to gain insight into a question or situation by way of …reading signs, events, or omens, or through alleged contact with a supernatural agency. … Divination is often dismissed by skeptics, including the scientific community, as being mere superstition. These definitions are based on an outdated space and time paradigm; namely a Newtonian–Classical Paradigm before the advancement of quantum-relativistic physics. They were wrongly defined, especially if we examine these definitions in the light of the Mind-Being Paradigm as developed in this Website. 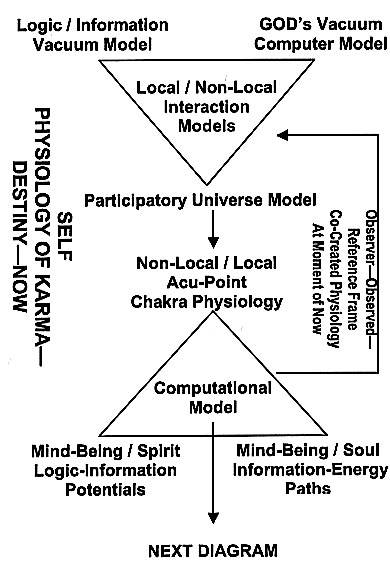 That is to say, we need to examine the definitions of Divination, Destiny, and Karma in the lights of models developed for the Matter-Being Paradigm, as indicated below. Furthermore, they must be defined in terms of a Holon, namely Divination—Destiny—Karma depicted by a triangle. That is to say, we need to examine the Human Self from the physiology of Acu-Points and Chakras. If we accept the existence of a Logic-Information component of Matter, then we need to examine the existence of a Mind-Spirit spaceless–timeless Logic Vacuum component of human physiology. From the wave (Information-Energy Path) component of matter, there exists a Mind-Soul spaceless–timeless Information Vacuum component of human physiology. With these clarifications, we can go to the next diagram on formulating the computational models for these three Matter-Being components. Percentage of capture —> Computed minus the various perturbations coming from non-local free will together with entanglement, and from the local physical environments (“the remains after passing through the non-local and local filters”). Percentage of capture is a function of individual soul-spirit maturity: A Higher percentage implies a higher maturity. Awaken —> Knowing (Consciously) one’s Destiny and Karmic Issues. High maturity does not automatically imply awakeness. In a limited computational set, we discover that 80% of the individuals are either too immature (or with a small percentage of capture) and/or are not awakened. Notice, soul-spirit maturity is also computed within these resonant models. This explains the inaccuracy of Karma–Destiny computations. In addition, even within these 20%, the accuracy and details cannot be confirmed unless the individual possesses the capabilities of mind-spirit knowingness and/or mind-soul perception. Within this capable set, these computations are used to guide the individual’s knowingness and/or perception. These difficulties explain the notion of superstition connected to this subject. Most of these models have been discussed or can be easily found in literature, except for the involution logic of a human physiological state. Also, the weighted resonant parts of the computations in the models are new and unique. 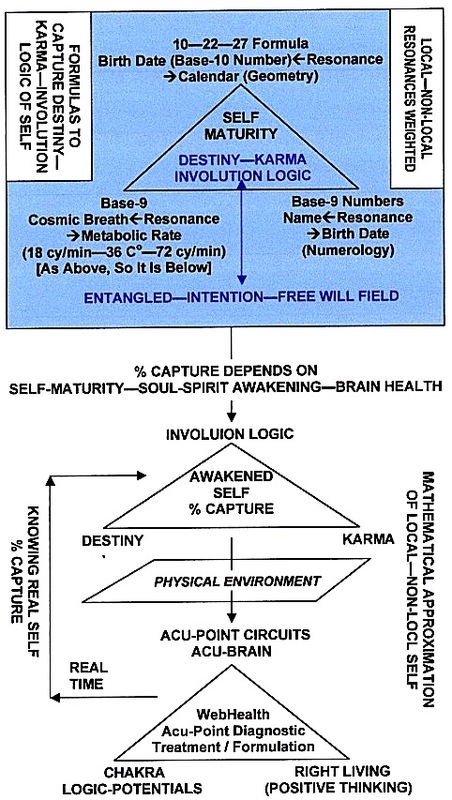 An example of an Involution Logic Physiological State is the resonance between Cosmic Breath and Metabolic Breath (as indicated in the above diagram), and further detailed in the diagram below. Another example of the Involution Logic for Human Physiology is illustrated in Diagram 1, on the Holon of Godliness in Self—Sageness Within—Kingliness Without, in the posting On Positive Psychology and Holon Physiology. The cosmic breath Holon is obtained from the Nei Ching (Classical of Chinese Medicine) and the number 1080, which represents one of the numbers in sacred science. In the words of John Michell in The Dimensions of Paradise. In the operations of simple arithmetic and throughout all the numerical manifestations of nature, such as the periods and intervals of the solar system, certain ‘nodal’ numbers occur, providing a link between processes and phenomena which otherwise appear quite unconnected with each other. Most prominent among these are the multiples of 72 … [which can be reduced to the number 9 in Base-9]. Hence, 18 can be taken to be the breath of the Cosmo. 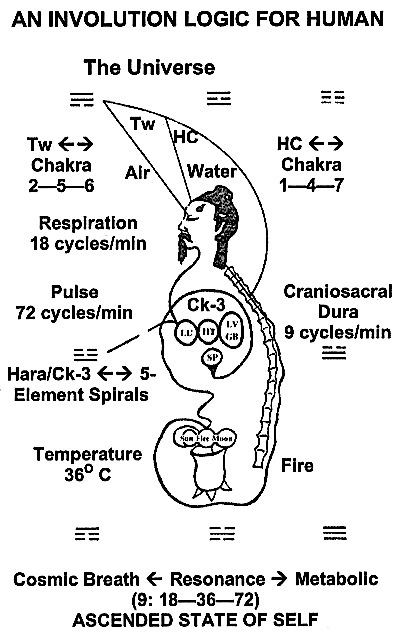 Thus, we can derived the resonance between Cosmic Breath and the Optimum Metabolic Rate in Human Physiology. The Resonant Holon represents one of Involution Logic in Human Physiology Physiology. Thus, Positive Thinking involves with specific knowledge on What you thinking About and the How to accomplish What you thinking About. This knowledge is stored in the library. These are learned and can be learned knowledge. This thinking is also only one component of a Holon. The other two components have to do with the thinking functions of the Mind-Soul and Mind-Spirit. Mind-Spirit “thinking” involves with Knowing the Involution logic in the Computer Program. Mind-Soul “thinking” has to do with visions and/or feelings programmed in the subroutines with drivers within the Computer Program. The former is pre-encoded by God at the Big Bang: the What –> the Logic-Information Potentials (in Matter –> the Law of Nature; in Human Being –> the Acu-Points –> Destiny) and the How –> Information-Energy Paths (in Matter –> the Least-Action Principle; in Human Being –> the Chakra –> Karma). The latter is the co-created paths, including the misinformed and the destructive (i.e., the evil paths): the What and How have to do with the Applied Science, including Human Science and Wisdom. The interaction of the two is Bio-Quantum Physics. Positive Thinking in today’s Positive (especially popular) Psychology involves only thinking without knowing the specifics of the What and the How, let along the connections, if any, to the mind-spirit and mind-soul components of this What and How as described in the above paragraph. At the minimum, Positive Thinking should at least include the learned or can be learned knowledge on the What and the How in the thinking process. Remember, most of the What and the How are entangled thinking inside a free will field, e.g., thinking of becoming a millionaire.